Make it fun to learn. Do you remember back when you were in school? You had a favorite class. Your favorite subject was the easiest to learn. If you adopt an attitude that you are going to have fun while improving your photography, it will be so much easier and so much more enjoyable. Adopt a childlike curiosity about exploring the world with a powerful and user friendly tool, your camera. Take your time. I've been learning photography for over 40 years and feel like I've just begun. I still make plenty of photography mistakes just like other professionals. I'm still learning how to take better digital photos. There is so much to discover, but you can acquire skills in anything you want if you develop a burning desire to do so first. Okay, enough of the beginner pep talk. Let's dive into 4 ideas that will help you get off to a great start with your photography. 1. FIND OUT HOW YOUR CAMERA WORKS. Sit down at your table with your camera ready and read the camera instructions that came with the camera. I know what you're thinking. If you're anything like me and a lot of other newbie photographers, the last thing you want to do is take the time to read the camera instructions. The truth is that if you do a little reading ahead of time, you'll learn how to use your camera to get some great photos. I know it's written in a technical and perhaps boring manner, but if you commit just 30 minutes of time now, you save hours of frustration because you weren't with the modes and settings of your camera. If you don't have printed camera instructions, go to your camera manufacturer's web site and see if it's available online. Try out the different camera settings as you read. Have fun and play around a little. See how the different camera settings affect how your camera works. Make sure you know how to load a new memory card. Learn how to change the batteries. Always, and I repeat always have fresh spare batteries with you. There is nothing more frustrating than having a photo opportunity and not being able to take a great photo because your batteries are dead. 2. GOOD PHOTO COMPOSITION. When you are learning beginning photography, there are several rules of composition to use as guidelines. The rule of thirds is a great one to learn first. It is a photo tip on where to place the center of interest in your photograph. It's such a good beginning photography tip to be familiar with. For a thorough understanding of this technique, read about the rule of thirds. Another idea is to try composing your photo while using diagonal lines to create interest. I use diagonal lines quite a bit with nature photography. In the photos above, the edge of the ice, the slab of rock, the young girls legs, the horses neck and nose, and the fence create a little visual interest as diagonals. Compose your picture by holding your camera to shoot both horizontally ("landscape") and also by holding your camera vertically ("portrait.") Remember with digital photography, you can easily erase your bad photos. Another photo composition trick for beginner photographers to learn is the use of "Leading Lines. "Leading lines are often diagonals. Sometimes they may be straight and sometimes they are curved. What they do is lead your eye into the photograph because your eye naturally follows the line. Just be careful to not use a line that takes your eye out of the photograph by mistake. In both of the nature photos below, our eyes follow the paths into the photographs. In the snow scene below, the path was formed naturally on the surface of a frozen pond shortly after a snow storm. It has a pleasant "S" curve shape. In the Fall scene to the right, the path is a man made stone path that creates the great leading line. Position yourself to take advantage of compositional elements like these. 3. DISCOVER THE BASICS OF LIGHTING. Lighting is everything in photography. You don't have to be a master. It's a bit challenging when you are a beginner photography student. First learn to see what direction the natural light is coming from. Next, you will see if it is more of a direct light or is it reflecting off of something. Is it producing soft shadows or distinct harsh shadows. Is it illuminating your subject in a pleasing way? Try moving your camera (or your subject if possible) to a different spot for better lighting. Is it possible to use your camera's fill flash or a reflector to add some fill light that lights your subject? Check out a more in depth coverage of lighting. 4. BE PREPARED TO FAIL. This can be the hardest to accept for new photographers. Sometime it seems like taking an amazing photo should be real easy, but it takes a bit of practice to get good at most things. Photography is no different. Think of a disappointing photo as an opportunity to learn rather than a "failure"
Thomas Edison tried hundreds of times to design a light bulb that would work. Fortunately, your camera is your best friend if you just learn to know her a little bit first. It's an amazing piece of technology that can handle just about any situation for you. 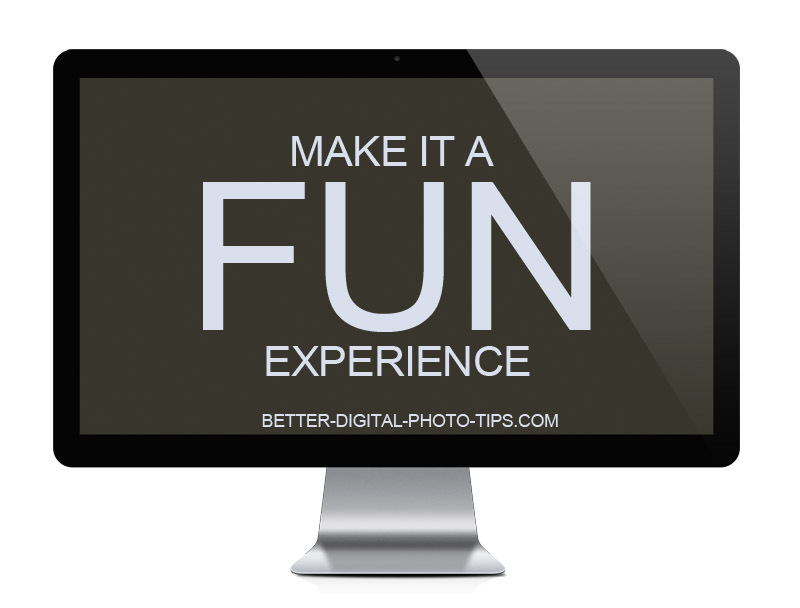 Review these 4 photo tips briefly and then explore any one of them in more detail. Keep a camera handy at all times. If you do, you will have many more chances to take great photos. The more you focus on the idea of creating great pictures, the more your mind will find subjects to photograph. Have the right equipment too. If you are in a low light situation you may have to use a slow shutter speed. You can void getting blur by using a tripod or a monopod. Macro Photography for Beginners. How to do macro photography and great tips on macro photography for beginners. Beginning Photography Tips-Understanding Shutter Speed. One of a series of articles with beginners photography tips-this one with respect to shutter speed. How Cameras Work. Get just a basic understanding of how cameras work before you waste a lot of time shooting bad photos. mistakes. Check out this easy to understand page on how camera work. Digital Camera Buying Guide. If you are looking to buy a new digital camera, you may be interested in reading what common mistakes to avoid. Best Tripods for photographers just starting out. Tripods can do so much in several different ways for photographers at any level of expertise. You'll want to use a decent tripod but don't want to spend a ton of money on one. 3 Advanced Tips in Photography. Before you study advanced photography tips, you may be interested in these 3 tips, which can apply to anything in which you wish to do at an advanced level.